Remember when you were a kid and you got a “participation award” for just showing up to your soccer games? Well, the US government had a similar certificate that it’d hand out. As you can imagine, it was for something a bit more serious: Nuclear tests during the Cold War. That’s right, if you were involved in a nuclear test in the latter half of the 20th century you may have received a colorful slip of paper certifying that you had been there. Flickr user Kelly Michals has compiled a Flickr album of the certificates and some of them are actually quite amusing. You can see Michals’ complete collection on Flickr, but we’ve pulled out a few of our favorite certificates (if only for aesthetic value) which you can see below. 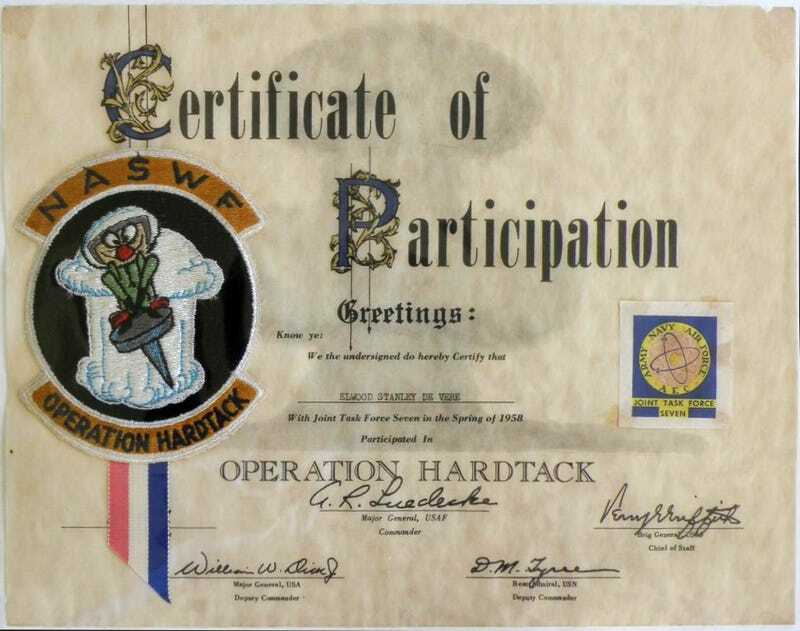 Above we see a certificate from 1961 for Project Gnome, the first test involving Operation Plowshare, an initiative to use nuclear bombs for peaceful purposes on US soil. And yes, that’s the Seven Dwarfs blowing up what appear to be salt mines. It’s a good thing that Disney’s lawyers never saw this thing. Diagonal Line was an underground nuclear test conducted on November 24, 1971. Part of Operation Grommet, the test utilized the “Ship of the Desert” to house experiments above ground and measure various effects. Pile Driver was an underground nuclear test conducted on June 2, 1966. Part of Operation Flintlock, the explicit goal of the Pile Driver test was to measure what kind of damage a surface explosion would have on an underground command center. The simulated command and control center was embedded around granite rock. Mission Cyber was a relatively small underground nuclear test conducted in Nevada on December 2, 1987. It was part of a series of 13 tests conducted in 1987 and 1988 that were known collectively as Operation Touchstone. With its flying (superhero?) robot, Mission Cyber definitely had one of the coolest patches ever. Operation Roller Coaster was a joint US-UK series of open air tests that were conducted in 1963. The tests were supposed to measure the kind of contamination that would occur in the event of transportation accidents with nuclear material. Operation Redwing was a series of 17 nuclear tests conducted between May and July of 1956. Staged in the Marshall Islands, including the Bikini and Eniwetak atolls, the tests included the first air-delivered hydrogen bomb. Muenster was part of 21 nuclear tests conducted in 1975 and 1976 in Nevada. Like so many of these certificates, there’s a lot of imagery that means absolutely nothing to me, but probably means a whole lot to the people who were involved in the tests. An octopus wearing a bandage with a TV camera, a hacksaw, and a flashlight? I have no idea what that means. But it’s probably a fantastic in-joke to the people who were there! The Mint Leaf test was one of 53 nuclear tests conducted during 1969 and 1970 as part of Operation Mandrel. Photos of teams waiting to re-enter the testing area for Mint Leaf can be found at the Nuclear Testing Archive in Las Vegas. Misty Echo was one of 11 nuclear tests conducted in 1988 and 1989 collectively known as Operation Cornerstone. The tests involved measuring tunnel damage during seismic activity. Again, there’s lots going on in this illustration. But you’d likely have to talk with the illustrators of all these images to get the full story. Any grad students looking for a free idea, you’re welcome.